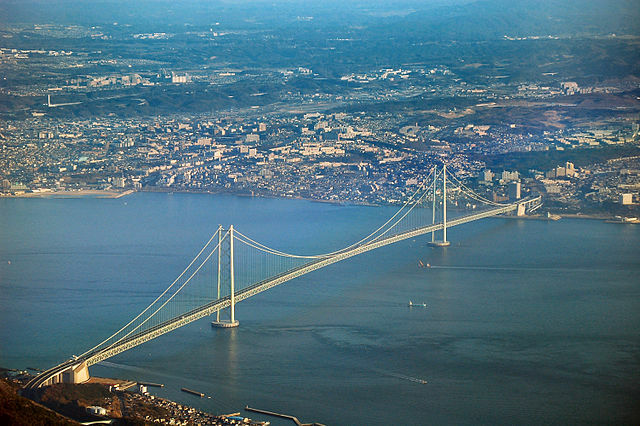 With the length of almost four kilometers the Akashi Kaikyo Bridge is the world's longest suspension bridge, which links the city of Kobe on the mainland of Honshu to Awaji Island. 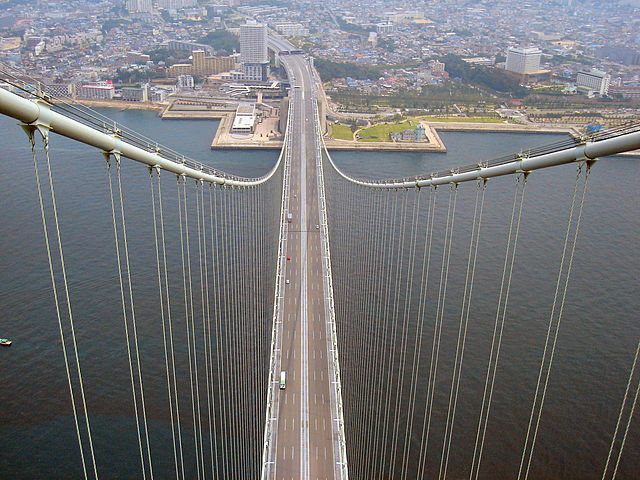 The bridge crosses the busy Akashi Strait "Akashi Kaikyo" as part of the Honshu-Shikoku Highway. It has three spans; the central span is 1,991 meters and the two other sections are each 960 meters. The two main supporting towers rise about 283 meters above sea level. 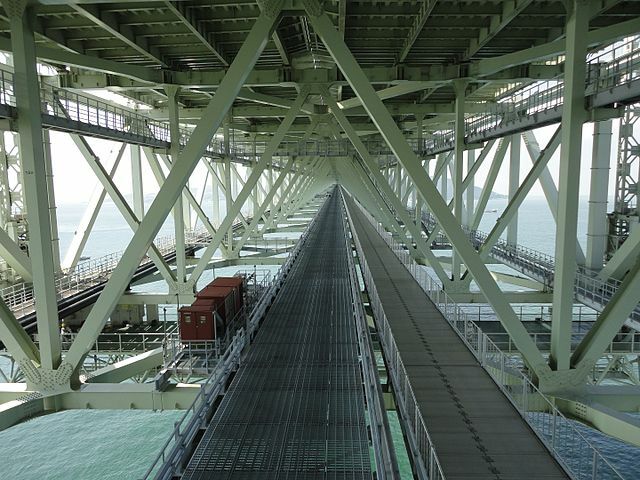 The bridge was designed with a two hinged stiffening girder system, allowing the structure to withstand winds of 286 kilometers per hour, earthquakes measuring up to magnitude 8.5, and harsh sea currents. ​Two parks in proximity of the bridge have been built for tourists, one in Maiko "including a small museum", and one in Asagiri.Both are accessible by the coastal train line. 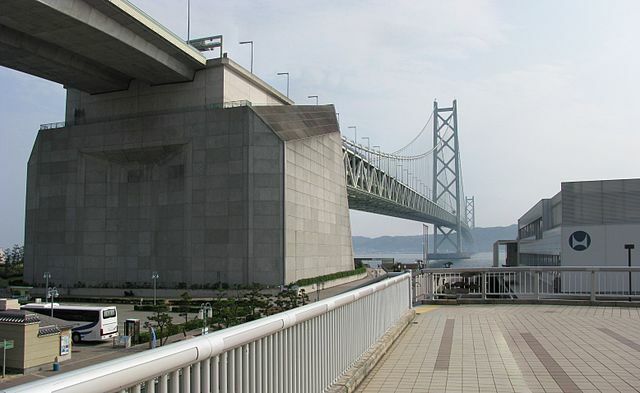 ​The Maiko Marine Promenade consists of observatory hallways under the bridge's platform, about 50 meters above the water. The fee for adults is 250 yen "310 yen on weekends and national holidays". The Bridge Exhibition Center at the foot of the Kobe side of the bridge is a science museum that introduces the Akashi Kaikyo Bridge and its technology from different angles. ​Information about other suspension bridges around the world is also presented in the museum. The fee for adults is 310 yen. Bridge enthusiasts should also consider participating in the Bridge World guided tour, which includes a visit to the very top of one of the bridge's 283-meter-tall towers. While walking on the maintenance path the guide gives you the information on the bridge’s history and technology. The tour is in Japanese only and held twice a day on Thursdays, Fridays, Saturdays and Sundays. It takes 2 and a half hours, involves about 2 kilometers of walking, costs 3000 yen per person "adults" and requires advance reservations. 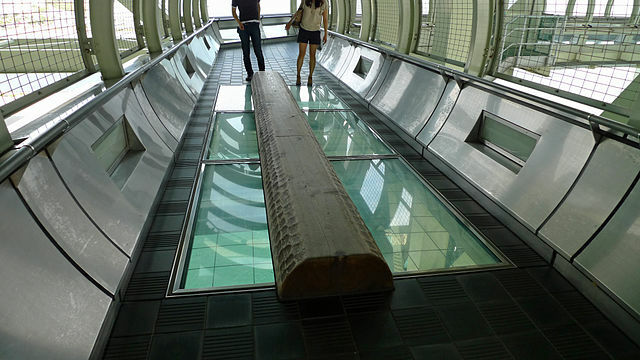 ​An admission fee includes entrance fees to both Bridge Exhibition Center and Maiko Marine Promenade. The Maiko Marine Promenade is located a 5 minutes’ walk from Maiko Station on the JR Sanyo Line "takes about 25 minutes from Sannomiya Station by local train", or 10 minutes’ walk from Maiko-Koen Station on the Sanyo Railway Main Line. 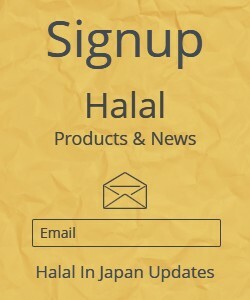 For more information visit Tourist Information Centers.